Either you are writing a research proposal for a journal, or just taking an examination after a tedious session of preparation but if you don’t have command on spelling you will end up making spelling mistakes that will ruin not only your grades but also hurt your face value. All your hard work and efforts will go in vain. In contrast, if you have your writing is beautifully equipped with fancy word and correct spelling you will certainly get good grades. All this comes with a good memory. A good memory is like a guard of your house having the responsibility of the security of you and your precious stuff. The responsibility dealt with efficiency will bring the safety of the treasured matters but a careless guard will always let you down. Such is the case with memory. A good memory will take care of the treasure inside the brain and hand it over whenever needed but a rotten or bad memory will throw it into the deep dark well of the brain and always be a source of disappointment at the eleventh hour. Spelling Bee competitions are a traditional tool of enhancing your memory to keep the spellings stick to your mind. Simply putting, it’s a way, with quite some prestigious history, of polishing the spelling skills. Students/Teachers at all levels rely on this useful tool to save one from humiliation at the academic level. Moreover, competition as such is a great derivation of expanding students’ vocabulary. Also, students learn to accomplish the task that seems difficult to them in given time. In the same way, it proves to be the source of letting participants deal with the mental pressure, a therapy in its unique way. In these spelling bee certificates competitions, learners are provided the opportunity to come out of the box and dare themselves with something competitive. The excitement and hope of winning the award become a stimulus of its own kind to incite enthusiasm among participants. The best part is that the participants come up with their academic need in a co-curricular activity that otherwise seems boring to them. 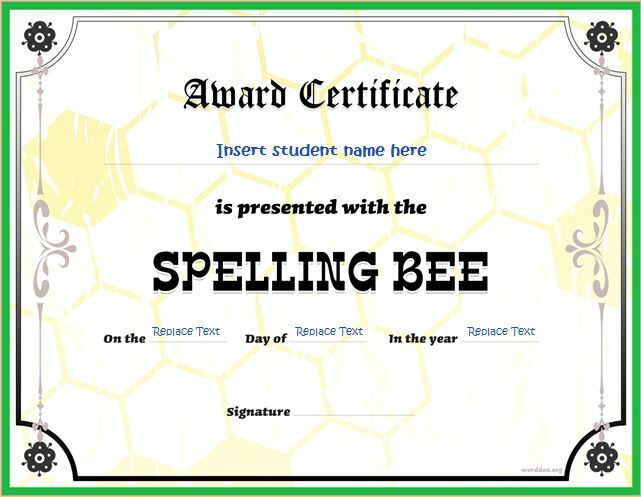 In short, spelling bee certificates prove to be the fundamental stimuli for participants to polish their spelling skills and obtain good grades. 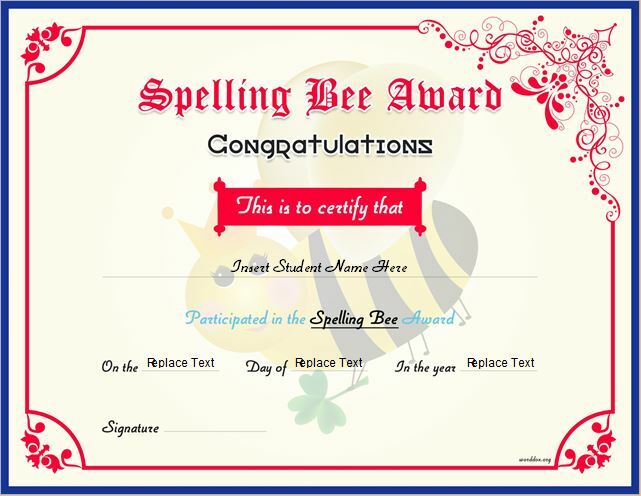 Following certificate templates which are designed using MS WORD software can be utilized to award those students who passed spelling bee contest with flying colors.